The team of developers at SkyNite wanted to give life to their app, codenamed Socialite. The goal of the app is to make it easier to find a nightclub or bar that plays the music you like, and has the crowd you're looking for. They had worked out wireframes beforehand and provided a very detailed document about app features and flow, but it was very cluttered and clunky, and in need of major streamlining. We created some user scenarios and tweaked the developers' wireframes as information was prioritized and as issues came up. For example, the club capacity was considered a low priority item and dropped from Top Search Results in favor of the club's distance and if it was open. We also realized that the data on gender and race of club audience would have to come from people that had a profile filled out while checked into a venue, so we had to incentivize the check-in process: you couldn't contribute to the discussion or collect "winks" from others if you weren't checked in. Early concept handed to me by developers. The idea is there, but the information needs to be organized better. What is most important when a person pulls out this app? Do we need to know a club's total capacity in the list of Trending Places, or is a user more interested in its proximity and if they're open? The team presented the app to promoters and advisers for feedback, and through some observation at the club and surveying, as well as researching failed nightlife apps, we found a huge flaw: the majority of people might check in as soon as they got to a club and take photos, but as they got drunk, they wouldn't want to do anything further and ignored it. Cell phone reception became an issue. I signed up for proximity dating apps and realized that the experience was kinda creepy. We decided that the "meeting people at the club" aspect would have to go. We decided to rethink things: the app would be about seeing a live feed of local nightlife, finding the right place, getting in with the help of a promoter, collecting stamps from each club, and sharing one's personal experience. Instead of focusing on the social aspect, we would focus on specials someone with the app would be privy to: finding the perfect place for them, personal treatment by a promoter, and earning rewards. 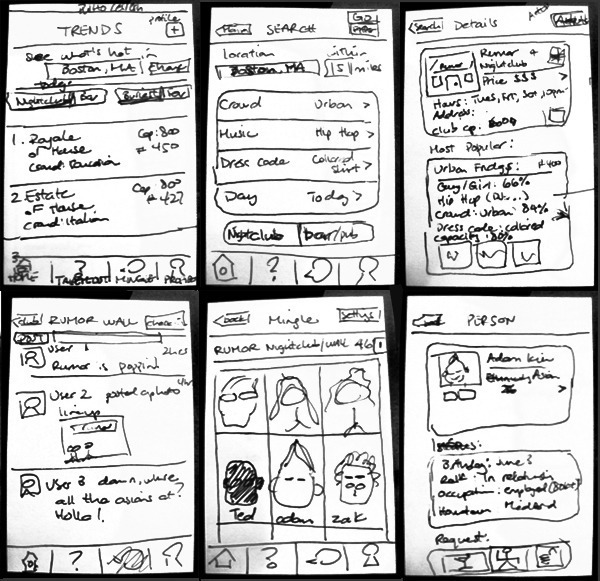 Socialite was my first UX project, and I came in with no previous knowledge of UX process or methodology. Needless to say, I learned a lot about what works and what doesn't the hard way. Biggest takeaway: Conducting user research before starting is imperative, and performing user tests on wireframes before heading to pixel-perfect Photoshop mockups is also a must because it doesn't matter how shiny the buttons are if they're in the wrong place.